Officially the UK’s fastest growing classic car event, over 21,000 enthusiasts joined us for the Practical Classics Classic Car & Restoration Show 2017, bringing together all aspects of classic motoring. From barn finds discovered after many years of storage and those project cars that have stalled in an owner’s garage, to restorations just getting back on the road and those pristine marques with gleaming brightwork and proud as punch owners. 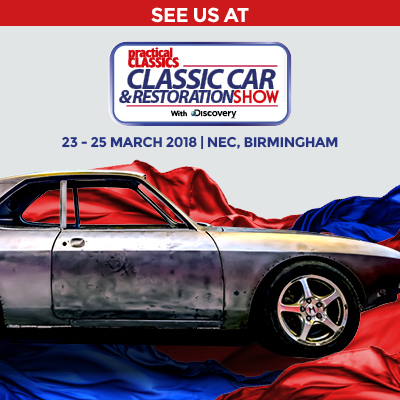 If you need help and advice from our motoring experts and celebrities, want to buy the tools to do the job yourself or find a specialist restorer who can tackle the work on your behalf, this is the show for you. With cars for sale from both dealers and a sale from Classic Car Auctions, live demonstrations, and over 1,000 cars on display, keep your eyes open for when tickets go on sale for the 2018 show! Discounted tickets are available to club members when you quote the promotional code that can be found in our Members Area.